53 w w w . M o d e r n T i r e D e a l e r . c o m or Signal Tech II Tool J-50190 before ID registration can be performed. Use the fol- lowing procedure when using the transmitter activation tool J-45295. 1) With the ignition switch in the OFF position, connect the scan tool to the data link connector (DLC). Turn the ignition switch to the ON position. 2) Display the "WORK SUPPORT" screen, and select "ID REGIST." 3) With the transmitter activation tool (J-45295) pushed against the le front tire air-valve, press the button for five seconds (see Figure 1). Sensor activation must be performed in this order: le front, right front, right rear and then le rear. As each sensor ID is activated, the hazard warning lights and the TPMS warning light will flash four times, and the scan tool indicator light changes from red to green. 5) Check that the transmitter wake-up procedure for all wheels is completed using the scan tool. 6) Aer completing the wake up of all transmitters, make sure the TPMS warning light goes out. DEMOUNTING/MOUNTING PROCEDURES CAUTION: e tire should be demounted from the wheel using the tire changer manu- facturer's instructions. Use the following information to avoid damage during the demounting/mounting procedures. TIRE PRESSURE SENSOR CAUTION: Do not inject any tire liquid or aerosol tire sealant into the tires, as this may cause a malfunction of the sensors. Removal 1) Deflate the tire. Unscrew the transmit- ter retaining nut, and allow the transmitter to fall into the tire. 2) Gently bounce the tire so that the transmitter falls to the bottom of the tire. Place the wheel and tire assembly on the tire changing machine and break both tire beads. Ensure that the transmitter remains at the bottom of the tire while breaking the bead. 3) Turn the tire so that valve hole is at the bottom, and gently bounce the tire to ensure the transmitter is near the valve hole. Carefully li the tire onto the turntable, and position the valve hole (and transmitter) 270 degrees from the mounting/demounting head (see Figure 2). 4) Lubricate the tire well, and remove the top side of the tire. Reach inside the tire and remove the transmitter (see Figure 3). 5) Remove the second side of the tire as normal. Installation 1) Place the first side of the tire onto the rim. 2) Mount the transmitter on the rim and tighten the nut to 49 in.-lbs. (5.5 N.m). See Figure 3. NOTE: Do not touch the transmitter with the mounting head. 3) Place the wheel on the turntable of the tire machine. Ensure that the transmitter is 270 degrees from mounting/demounting head (see Figure 2). 4) Lubricate the tire well, and install second side of tire as normal. Ensure that tire does not rotate relative to rim. 5) Inflate the tire. Balance the wheel and tire assembly. 6) Install the wheel and tire assembly in the appropriate wheel position on the vehicle. 7) Ensure the front wheel alignment is correct. To adjust the neutral position of the steering angle sensor, turn the tires straight ahead and ensure that the steering wheel is in the neutral position. If it is not in the neutral position, go to the next step. 8) Remove the steering wheel and reinstall it correctly. If the neutral position cannot be attained by repositioning the steering wheel two teeth or less on the steering stem, loosen the tie-rod lock nuts of the steering outer sockets, and then adjust the tie-rods by the same amount in the opposite direction. 9) Register the tire pressure sensor. 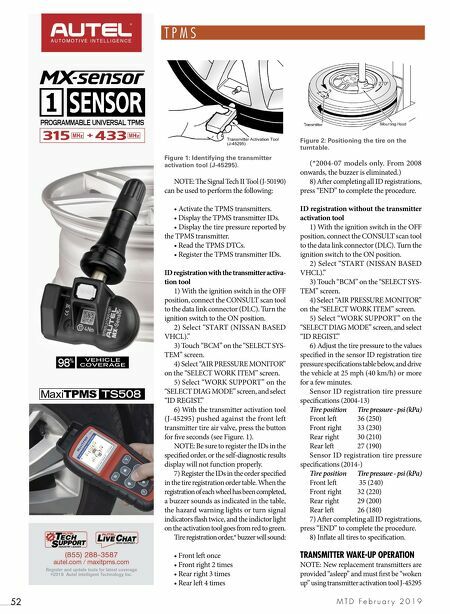 See "TPMS reset procedures." ■ Information for this column comes from the tire pressure monitoring systems data in ProDemand®, Mitchell 1's auto repair information software for domestic and import vehicles. Headquartered in Poway, Calif., Mitchell 1 has provided quality repair information solutions to the automotive industry since 1918. For more information, visit www.mitchell1.com. 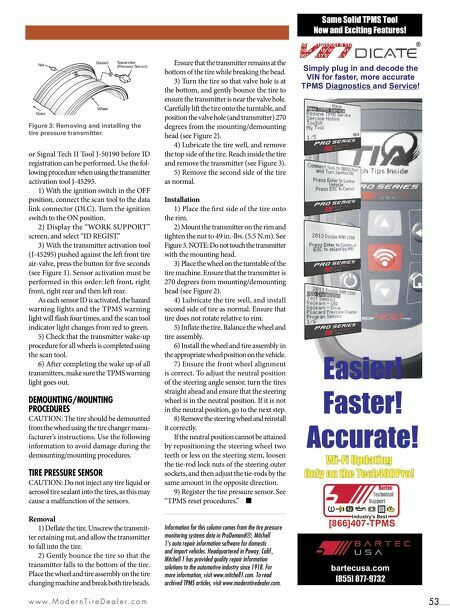 To read archived TPMS articles, visit www.moderntiredealer.com. Figure 3: Removing and installing the tire pressure transmitter.